ENCOSTA DE LAGO (AUS) (Bay 1993-Stud 1997). 3 wins to 1600m, VATC VicHealth Cup, Gr.1. Champion Aust. Sire twice. Sire of 1589 rnrs, 1119 wnrs, 111 SW, inc. Princess Coup (Hawkes Bay Kelt Capital S., Gr.1), Lashed, Puccini, Sirmione, Racing to Win, Alinghi, Sacred Kingdom, Mnemosyne, Delago Deluxe, English, Costa Viva, Chautauqua, Road to Rock, Smokin' Joey, Titanic Jack, Aloha, Newport, Delago Brom, Vanbrugh, Manhattan Rain, Northern Meteor, etc. MORE THAN SACRED (f. by More Than Ready). 5 wins from 1600m to 2400m, NZ$368,475, A$53,100, New Zealand Oaks, Gr.1, ARC Sunline Vase, Gr.3, Waikato Gold Cup, Gr.3, Counties RC HR Fisken & Sons Ltd H., 2d Cranbourne Cup, L, ARC John Deere Agrowquip H., 3d Auckland Cup, Gr.1, Waikato RC Sir Tristram Fillies Classic, Gr.2, 4th ARC City of Auckland Cup, Gr.2, Geelong Cup, Gr.3. Sacred Empire (g. by More Than Ready). 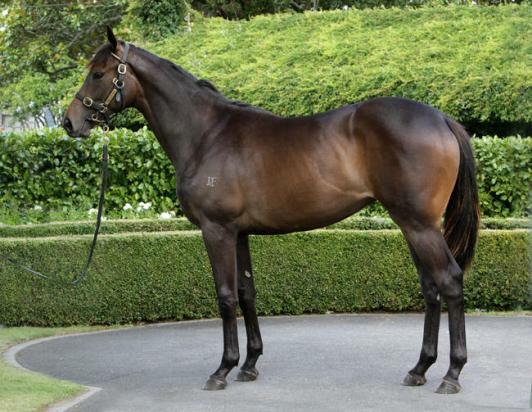 Winner at 2000m in 2015-16 in NZ. Danalaga (Danehill). 3 wins. See above. Crawfish. 15 wins from 1200m to 1600m, A$184,183, to 2015-16, MRC Cove Hotel H., 2d MRC Pura Light Start P., SAJC Panasonic Viera 2YO H., 3d SAJC Elders Real Estate H., 4th VRC Fashion S., L.
Ample Gains. 7 wins from 1400m to 1650m, HK$5,286,600, HKJC Castle Peak H., Dianthus H., Leung King H., Australian & New Zealand Bar Association H., Panasonic Momi-Momi H., Perfect Pearl Collection H., HKU Alumni Association Challenge H., 2d HKJC Hong Kong Lions Cup, New York H., Dallas H., Cheung Chau H., Chevalier Network Solutions H., Sasa Beauty H., 3d HKJC Panasonic Momi-Momi Massage Lounger H.
El Gitano. 4 wins at 1400m, 1600m, ARC Rotary Club Auckland East H., Waikato RC SVS Veterinary Supplies H., 3d ARC Gen-I H., Easy Ryder Retreat H., Avondale JC H Dyke H.
Multimighty. Winner at 1600m, HKJC Norfolk H., 3d HKJC Right Way H.
NORTHERN SPUR (Sadler's Wells). Champion turf colt in USA in 1995. Top of The 1995 International 4YO+ Classification (Long). 6 wins-1 at 2-from 1700m to 3000m, 860,000fr., US$1,460,000, Breeders' Cup Turf S., Gr.1, Santa Anita Oak Tree Invitational H., Gr.1, Longchamp Prix Hubert de Chaudenay, Gr.2, Saint-Cloud Prix du Lys, Gr.3, Hollywood Park Allowance, 2d Hollywood Turf H., Gr.1, Longchamp Prix Niel, Gr.2, Prix de Lutece, Gr.3, Saint-Cloud Prix Saraca, L, 3d Del Mar Eddie Read H., Gr.1, Atlantic City Caesars International H., Gr.1, Longchamp Prix de l'Avre, L. Sire. GREAT MARQUESS (Touching Wood). 10 wins from 1¼m to 24½f, £152,775 in GB and U.A.E, Doncaster Cup, Gr.3, Newmarket Jockey Club Cup, Gr.3, York Silver Cup, L, 2d Goodwood Cup, Gr.3, Baden-Baden Oleander Rennen, Gr.3, Milka Steher Cup, L, 3d Royal Ascot Queen Alexandra S., Haydock Park Champion Hurdle Trial, Wetherby West Yorkshire Hurdle. Sire. KNELLER (Lomond). 5 wins-1 at 2-from 1m to 2¼m, £109,885, Doncaster Cup, Gr.3, Newmarket Jockey Club Cup, Gr.3.Died at 3. WHITMAN (Poet's Voice). 3 wins at 2 in 2015, Ripon Champion 2YO Trophy, L, Newbury JLT 2YO S., 3d York Betway 2YO S.
ASTROCHARM (Charnwood Forest). 7 wins-1 at 2-from 7f to 1¾m, £114,319, Goodwood Lillie Langtry S., Gr.3, Haydock Faucets for Mira Showers H., Newmarket Robinsons Mercedes-Benz SLK H., 3d Goodwood Lillie Langtry S., Gr.3, Haydock Pinnacle S., L, Pontefract Castle S., L. Producer. GLYNDEBOURNE (Sadler's Wells). 2 wins at 1¼m, £156,520, US$5,060, HK$462,000, Curragh Gallinule S., Gr.3, BPB Gypsum Industries S., 2d Irish Derby, Gr.1, HKJC Centenary Vase, HK-3. Sire. L'EREDITIERA (Alzao). 3 wins from 1600m to 2000m, Rome Premio Carlo Chiesa, L, Milan Premio Tadolina, Rome Premio Peruviana, 3d Milan Premio Legnano, Gr.3, 4th Naples Premio Libero Perlini, L. Producer. LA VACANZA (Aussie Rules). Winner at 2 in 2015, Milan Premio Vittorio Crespi, L, 2d Rome Premio Alessandro Perrone, L, Premio Gray Ghost, 3d Rome Premio Andreina. ZAPEL (Kyllachy). 4 wins at 2 in 2015, Milan Criterium Nazionale, L, Rome Premio Divino Amore, L, Milan Premio Laveno, 2d Milan Premio Bersaglio, L.
Served by Sebring. Date of last service, 25.10.2015.